Many dieters get mislead into thinking they are having a low calorie lunch by ordering a salad when dining at a fast food restaurant. While fast food restaurant salads still help you integrate healthy vegetables into your diet, on the whole, the salads can be surprisingly high in calories due to other ingredients, like croutons and dressing. Soups are another food might seem like a filling low calorie fast lunch option. Beware, though, as soups can contain more calories and fat than expected, especially if they are very cheesy or creamy. Sadly, sandwiches can *also* have jaw dropping amounts of calories. Even the typically considered lean and healthy protein of turkey can be used with other ingredients to create a sandwich with more than 1,000 calories! 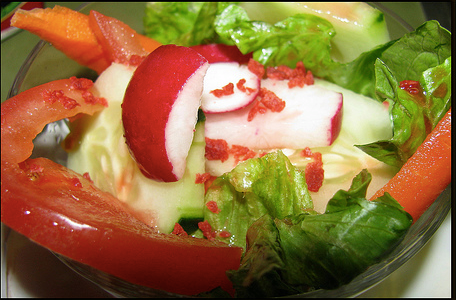 (1) Stick with lower calorie dressings for salads, and get the dressing on the side. And remember, a little bit of dressing goes a long way. Try dipping your fork into the dressing before each bite to get the minimal possible dressing to make your salad taste better. (2) Skip add-ons like croutons, tortilla strips, or other crunchy items in soups and salads. Skipping these can save 100-200 calories! That would be 1400 calories a week if you were eating these every day. (3) Pick soups that are not creamy (aka skip soups called bisque). Good choices are tomato based or broth based. (4) Skip cheese and dressing on your sandwiches. Or, opt for light dressing or a low fat cheese alternative (or even less slices of cheese)! Or, add avocado instead of cheese. And, consider eating the sandwich open face -- aka with just one slice of bread. Tastes the same, and you'll save a ton of calories. Welcome back, Juliet! I was so happy to see you pop up in my reader ... I've missed you! Looking forward to reading you again and great way to start out with these fast food tips. I don't generally eat any fast food at all, but these are great tips for any kind of restaurant meal.